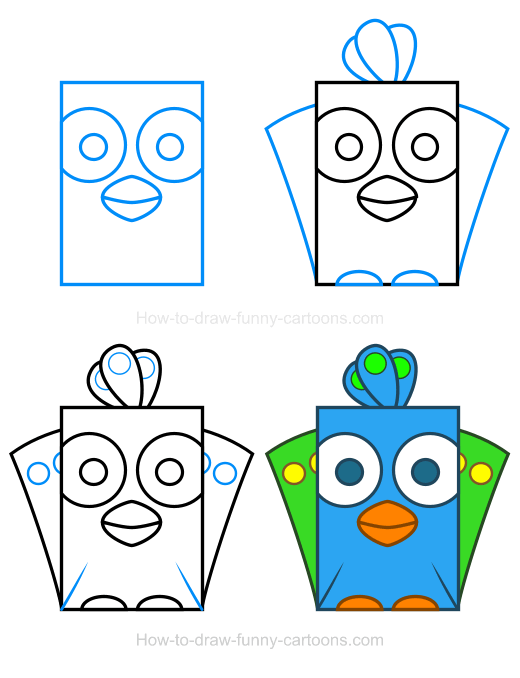 In this simple drawing lesson, you can learn how to create a peacock clipart made from rectangles, curved lines and circles. Also filled with bright colors, this cartoon character is accessible and easy to duplicate, even for beginners or young kids. Peacocks are fun animals to look at. The large tail covered with patterns that are often similar to eyes is visually quite impressive. The blue and green plumage is hard to miss and the large tail is supposed to be used to attract females and choose the perfect mate. 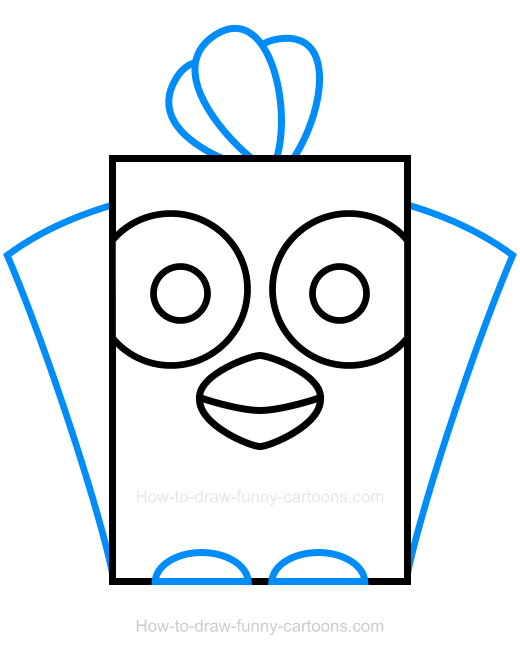 First, draw a large rectangle to create the body and the head of the animal. Then, sketch the eyes using large circular shapes as shown in the illustration below. The pupils are also made from small circles. 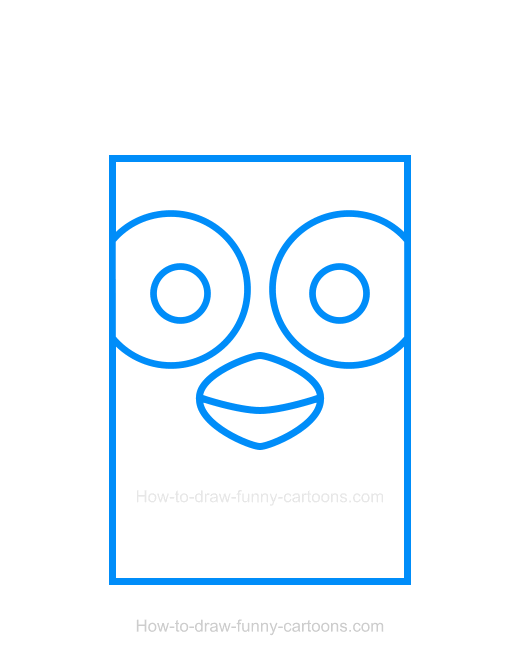 Finally, complete this step by drawing a beak using small curved lines with pointed ends. On top of the head of the cartoon peacock, use a few curved lines to create three long feathers. Then, you can draw the tail behind the character using a large rectangle made from curved lines. Finally, the feet are done using oval shapes. Once you are finished, you can proceed with the next step. For this third step, you can draw circular shapes inside the feathers on the head of the animal and on the tail behind this one. 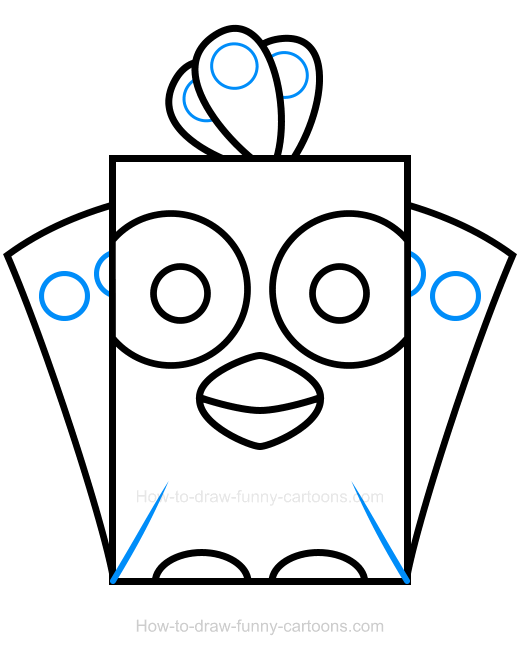 Two small lines are also added to create wings on the bottom of the rectangle used to represent the body. In this final step, you can add plain colors inside the characters. The body and the feathers on top of the head can be blue and the tail can be green. The beak and the feet are filled with a simple orange color. I also like to use colors for the outlines as shown below. Nice work creating a fun peacock clipart! This peacock clipart is now completed. Below you can see all four steps needed to create this wonderful cartoon character. 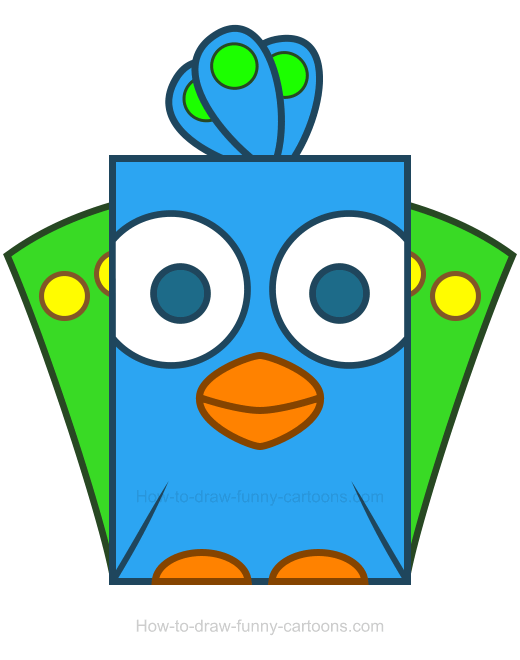 Have fun working on this great cartoon character and don't hesitate to create your own version.